Shoulder pain and injuries can happen to anyone. When they hit baseball players, it can strike them out. Here are the top three causes of shoulder problems, and three easy things you can do at home to support your shoulders and keep you in the game. 1st Problem: Lack of thoracic mobility, leading to increased stress on the shoulder. Most adults and kids have reduced mobility in their upper backs (called the thoracicpart of the spine). This is one of the most common things I see in my clinic. A stiff upper back directly impacts the position in which the shoulder blade sits, and also the shoulder’s function. A forward slouched posture, or a flexed thoracic spine, will tend to drive the entire shoulder complex forward. The rolled-forward shoulder position leads to extra stress at the front (the anteriorside) of your shoulder. This paves the way for limited shoulder flexion range of motion, as well as shoulder injury. 2nd Problem: Overuse of certain muscles in your arm, shoulder and upper back. Muscles are like ropes, with hundreds of fibers that make up each unit. When you “pull” or “tear” a muscle, either by injury or by overuse, you strain it by fraying a section of those small fibers. When a muscle strain happens, the body lays down scar tissue to patch the injury. But scar tissue is like a patch on jeans – it doesn’t have the elastic properties that muscle fibers do. If scar tissue heals in a shortened state, it will stay shortened long term and be difficult to elongate. This creates a “tight” feeling in muscles. These shortened muscles pull too hard on your tendons, causing them to overload and start to thicken up. Shoulders have very little room for thickened tendons, and they quickly become irritated and start to hurt. This can lead to bicipital tendonosis, which is the most common injury we see in baseball players at our clinic. 3rd Problem: Lack of shoulder blade stability. 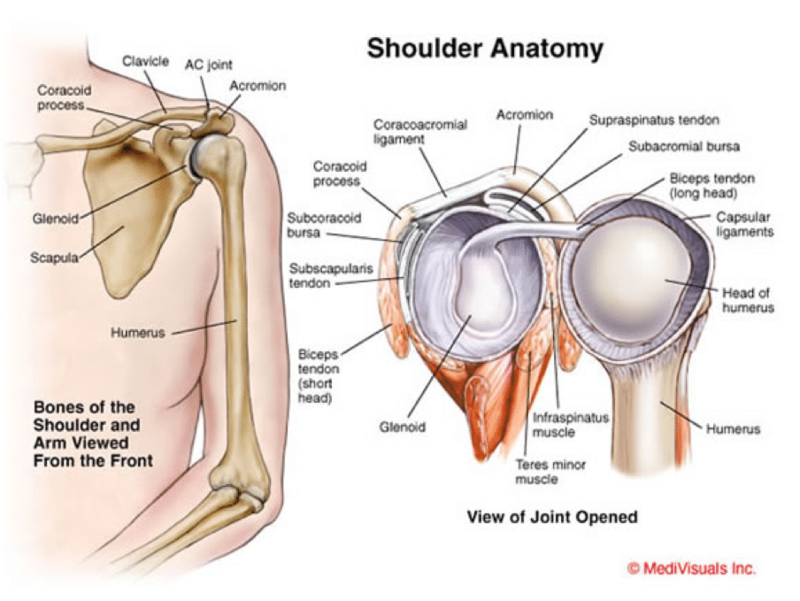 The shoulder blade (orscapula) is a large, flat bone that sits on top of the rib cage. It is held in place by the many muscles of the shoulder girdle. Unlike most other joints in the body, the scapulais only connected to your upper back by muscles – 17 muscles, in fact! All of these muscles must perform a coordinated dance for your scapula and entire shoulder to move effectively. And, if things were not already complicated enough, the scapula has 3 joints which all need to move properly. Deficits in muscle strength around the scapula can lead to uncoordinated movement, poor shoulder mobility, and a lack of power through your shoulder. These simple techniques will help stretch and prevent injury in your shoulder and arm. 1st Solution: Perform thoracic mobility drills on a foam roller. Using a foam roller is very easy, and you are in control of how much pressure to apply. Simply lay your body weight over the foam roller to apply pressure to a specific area. This will release myofascial trigger points and lengthen your muscles. I recommend rolling slowly over an area, finding the worst spots, and then targeting the sensitive spots by holding still there for about 30 seconds. Make sure to keep breathing and try to relax. Focus on not tensing up your muscles. The foam roller won’t be able to soak into the muscle if you are holding it tight. Remember you are in charge. Less body weight on the area means less intensity, more weight for more intensity. Start each session with low pressure and then build up. Avoid rolling over bone. Sit in front of the roller, with your hands behind your neck, head completely relaxed into your hands. Lean back over the roller, slowly moving from the top of the shoulder blades to halfway down the back. Let your spine curve like a rainbow. It may be uncomfortable – this is normal in the beginning. Lay the long way on the roller. Hold your arms out to the sides with the elbows bent at 90 degrees. Let gravity pull your arms towards the ground, feeling a stretch in the front of the chest. 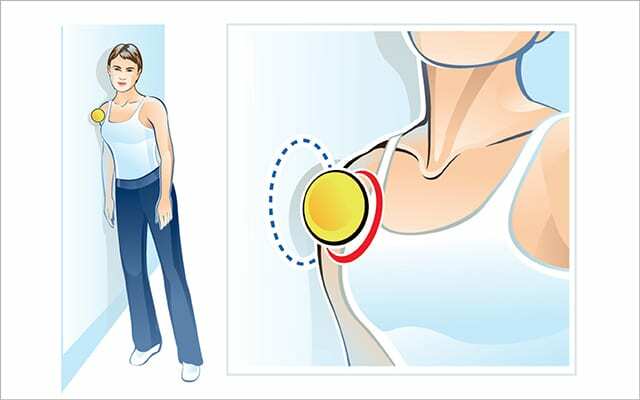 2nd Solution: Prevent an overuse injury of your shoulder and arm by foam rolling your subscapularis and lats then use a lacrosse ball on your bicep and pec minor. Dr Lee shows you how to use a lacrosse ball and the wall to release the pec. When is it time to get help from a professional sports doctor or manual therapist? If these techniques are not effective, then you need a professional assessment and advanced manual therapy. This may include active release technique, cupping, myofascial release, instrument assisted soft tissue mobilization, or massage. Having a professional do a hands-on assessment and work out the scar tissue is an extremely effective and quick way to recover. Whether you have a sports injury or trouble with everyday activities, our team at Head 2 Toe Spine and Sports Therapy is in ready position to be on your team. Call us at (425) 776-2936 or visit our New Patientspage to learn more and start improving your game today.